Winter biking activities are a gateway into fun events, socializing and progressive ideas, so take advantage of the sub-zero temperature to warm up to the biking niche without breaking a sweat. Whether it's visiting multifunctional bike venues like Serk or Natooke or participating in indoor events, get the social wheels rolling without chilly pedals testing your mettle. 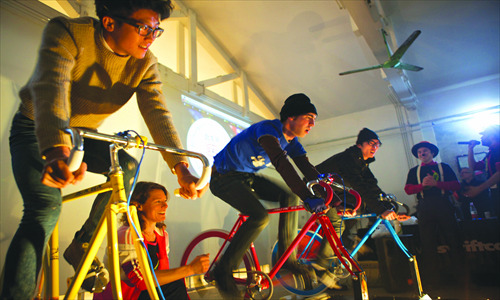 "Biking in the winter is a big concern which is why we decided to have something other than bikes," said owner Shannon Bufton, who runs the space with his wife, a Beijing native. The husband and wife duo are also co-founders of Smarter than Car, an aptly named platform that favors greener alternatives. "Serk is a very flexible space. We have a workshops for bikes in the back," Bufton said. "People may put their bikes away in the winter, but they can still learn how to keep their bikes up in the summer." "I thought it would be good to have a counter event to summer activities, [one] less competitive and more focused on having fun in the winter," said Brunn. "We'll have a costume ride, like we had for Halloween. We'll meet here at 8 pm and find Santa costumes for people who do not have them, then we'll ride," said Brunn. One obvious way to get involved is to treat the bicycle as it was intended, as a mode of green transportation. Don't be deterred from starting now. "I'm always confused when people say, 'I don't cycle anymore in the winter because it's cold,' and then they take the subway and walk forever. I find it much colder when you're [waiting] for a bus or taxi for 20 minutes," said Brunn. "You can put bags over your socks, [which] stops the wind from going in," said Bufton, recommending sticking hot pouches (available at any convenience store) inside gloves and on top of the toes. "Always cover your ears," Bufton added, knowing the value of keeping warm, after his feet started to go numb a few years ago from winter riding. "All the international kids in the area, especially Koreans, have cool looking fixed gear bikes…I'm sure that pretty bikes are a great conversation starter," said Theresa Tong, a 26-year-old Australian studying in Wudaokou. "But harsh wind is not my friend," Tong said, with no plans of using the bike as a social tool to sneak into the cool - no make that freezing cold - biking subculture.